"A delectable layered dip for any special occasion made with feta and cream cheese, pesto, pine nuts and sun-dried tomatoes. Vodka or gin may be substituted for the vermouth. Looks beautiful on the table, tastes heavenly on your tongue!" In a food processor, combine the butter, feta cheese, cream cheese, garlic, shallot, vermouth, and white pepper. Process until smooth. Oil a medium bowl, or gelatin mold, and line with plastic wrap for easy removal. 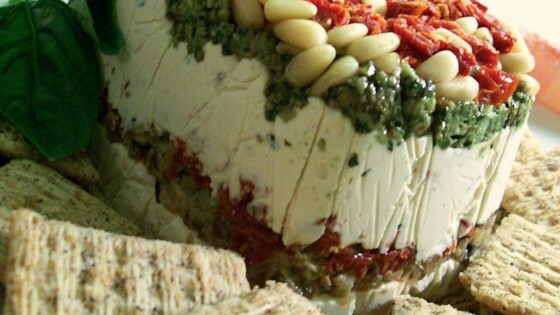 Layer the dip into the mold as follows: Sun-dried tomatoes, pine nuts, pesto, cheese mixture. Repeat. Pat down into the mold, and refrigerate for at least one hour. Turn the dip out onto a serving plate, and remove plastic wrap. Serve with crackers. A delightful dip that is sure to be a hit for any special occasion!